Broken Wing is definitely the star today. I was pretty late heading down to get him tonight (owing to a flat tire on my bike ride), so I took the truck. About halfway down the road who should I see, gamely hopping back towards your house. Quite touching! and such a trooper. I picked him up and just held him as I drove; he was quite happy with it all (and even gave Lola a good peck on the nose when she got too friendly!). The sibs greeted us enthusiastically when we reached the yard, and all three (successfully) begged a little nightcap of elk from me. I figure it’s good to keep that food connection strong so that they’ll follow me to the wash each day. Cindy was amazed (and relieved) that they had spent the whole day there, and I think she’ll be game to lead them there herself in my absence. All in all, I’d say really good progress today. To complete the picture, the wash is a quarter mile distant from our house. In order to reunite himself with his siblings and return to the ancestral roost, he made a beeline on foot for the entire distance. You have to love the guy. 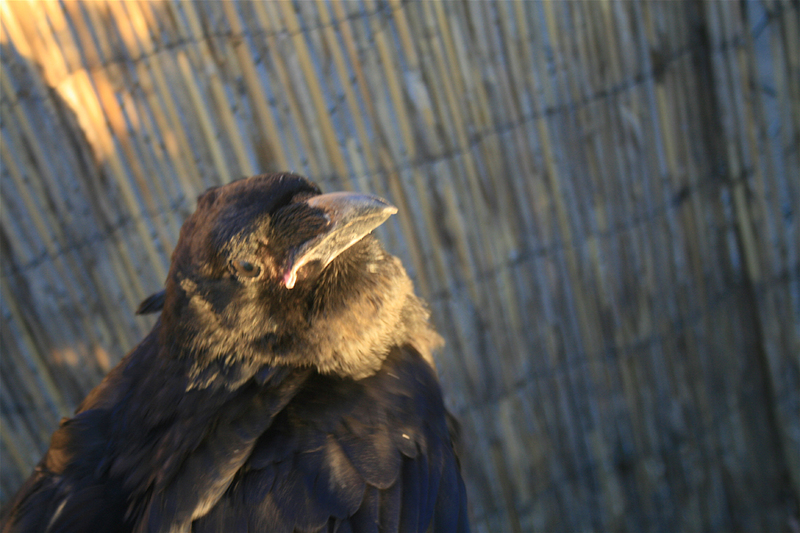 It also spotlights the importance of the intra-raven relationships as well as physical place. They need to be on the ramada by nightfall. It’s not willy-nilly choice, but rather a pit in the stomach as dusk advances and they’re not in a place considered safe. The beauty? When they are fully airborne and mobile and integrated, is there really any problem in a couple birds sleeping in our yard?